In many countries, the possession and use of radioactive sources are subject to authorizations and strict controls. In France, the Inter-ministerial Commission of artificial radionuclides (CIREA) fulfills this role. The accident occurred in 1987, in this modern city, capital of Goias state, southwest of Brasilia. This young man of 21 years old, exposed to a very high dose of 6 Sieverts, was severely burned and had to undergo amputation of the forearm. Irradiation accidents caused by the loss or by the dispersal of radioactive materials for medical, industrial and laboratory use are usually the result of negligence and defective controls. Fortunately, the involved activities are less important than in the nuclear industry, therefore the potential consequences of such accidents are also less important. In hospitals, most of the radioactive sources are made of short lived radioelements, that is to say, that their radioactivity is rapidly disappearing. It is not always the case. The accident in Goiania, Brazil, in 1987, is an example of criminal negligence. During the month of September 1987, several people are hospitalized in the hospital of the city with similar symptoms: digestive disorders, dizziness and localized skin lesions. 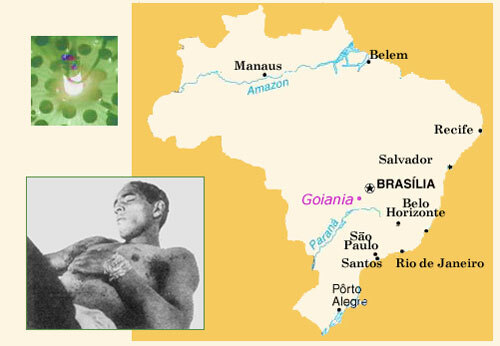 This epidemic is primarily attributed to a parasitic tropical disease common in Brazil. In reality, these problems were due to the exposure of a source of caesium-137 recovered by scrap merchants within a radiotherapy machine abandoned in a disused clinic. The activity of this source was high, about 50 TBq or 1375 curies (*). The scrap merchants had separated the source of its protective envelope and shown to many people this strange substance that emitted a blue light. They resold or distributed fragments. In total, it was necessary to examine more than 110 000 people, including 129 seriously exposed (among them 13 children). There were 50 hospitalizations and four deaths, including one child, 21 people receiving doses greater than 1 sievert (Sv) . The victims of these accidents are usually populations unaware of the risk in developing countries. In 1984 in Mohammedia, Morocco, a source of iridium-192 used by the gamma rays diagnostics weldings was picked up by a worker and had caused eight deaths (a whole family). In 1992, in Xinshou, China, a worker took home the sources of cobalt-60 for industrial use abandoned in a well (three deaths). Even in the United States, it happens that radioactive sources pass through the net of a strict monitoring. In 2003, sources were found inside a truck abandoned by a bankruptcy contractor in a field. Another ruined contractor, more civic, reported by phone that he left his truck with sources inside a parking lot before crossing the Mexican border. In the Russian far north and Siberia, the Soviet Union equipped about a thousand beacons and uninhabited lighthouses with thermoelectric generators called RTG. These RTGs use the energy of radioactive decays of strontium-90, a radioisotope much cheaper than plutonium-238, but less efficient. These generators well over 10 years of operation were often left abandoned. Scrap merchants, who unaware of the risks of radioactive contamination, sought to retrieve the metal casings, have vandalized some of them. For its part, the Soviet Union had used the heat of radioactive decays to feed power lighthouses and unguarded navigation beacons. Using strontium-90 as radioisotope, these generators provide a stable and reliable source of power. However, these generators could cause environmental and security problems, leaks or thefts of such radioactive materials having good chance to go unnoticed for years or even forever (some beacons could not be located due to lack of monitoring). It has been reported that a thief would have opened the compartment of radioactive materials and probably died from contamination and radiation poisoning. 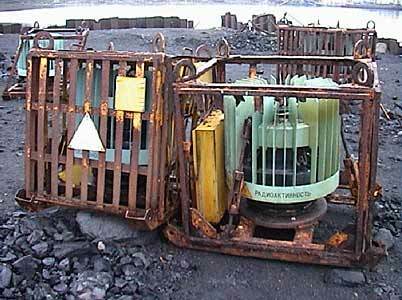 Norway has been very involved with the removal of the dangerous strontium batteries from the 180 lighthouses along the Barents Sea and White Sea coastal areas.The last of the remaining radioactive sources used to provide power to lighthouses in the Barents Region was removed at the end of 2009. The last others 11 RTGs on the islands of Novaya Zemlya, Kolgoyev and Vaigach are also removed now.